A slogan like “Come To Colorado” should be used to tell more people about this great state! Then again, the more people that move here, the less wilderness there will be… and Colorado’s rich wilderness is one of the things that make it an ideal destination for big game hunting. The Dixie Chicks once had a hit song with “Wide Open Spaces.” Well, they could have been singing about Colorado. Did you know the state has more than 23-million acres of public land? That number should astound you– 23-million! If you were to turn that acreage into a state, itself, it’d be the size of Indiana! In Colorado, there are several places to hunt, including national forests, state wildlife areas, state parks, and state trust/Bureau of Land Management lands. Looking for vast expanses of open terrain to hunt big game? Come to Colorado. Thankfully, Colorado makes it easy to obtain hunting licenses. Okay, here’s where it gets even better. 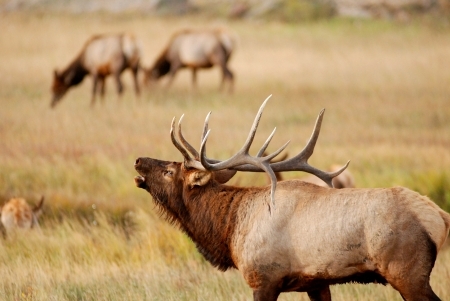 Want to hunt elk? Colorado’s elk herd is huge. Some 270,000 elk roam around Colorado. And Colorado is the only state to offer unlimited, bull-elk licenses to hunters during the second and third rifle seasons. Do you like diversity? If there were one state in “The West” to hunt in, Colorado would be/should be your “go-to” state. The diversity here is amazing. Of course there are plenty of majestic elk, but don’t forget there are moose, bighorn sheep and mountain goats, too. Like deer? Then be on the lookout for whitetail and mule deer. You’re also likely to find pronghorn and black bears. Finally, Colorado’s backcountry is a sight to see. Many hunters describe the look of Colorado as “epic.” You’ve got alpine wilderness, wooded forests, and open prairies. It’s like a cool movie set come to life, and you’re the star. Samuelson Outfitters, out of Fraser, Colorado, offers expert deer/elk hunting guides, helping you create the hunting trip of a lifetime. For more info, call 970-726-8221. Now’s a great time to “come to Colorado,” and if you do, be sure and bring your camera. Not only will you get some great scenery pictures, but, hopefully, you’ll also be able to take pictures of the deer/elk you shot so you can show off to your buddies and tell tales for years-to-come!